Collagen is the base material of bone (90% of the bone tissue). Collagen fibre bundles form the framework of the bone. Mineralisation, or calcification, is due to the deposition of calcium on the collagen fibres, in particular hydroxypatite crystals (which are actually spare calcium crystals). It is calcium that gives bone tissue its hardness. At the same time, the skeletal structure becomes a storage system for 98% of the body's calcium. The skeletal structure of a fully-grown horse is not an unchanging structure. 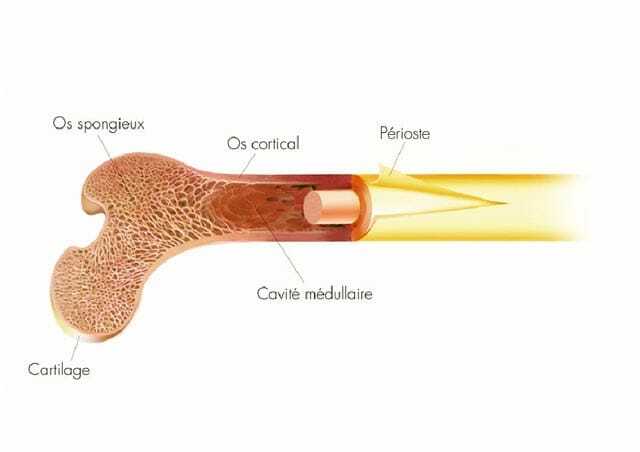 Throughout its adult life, bone will be remodelled according to its workload and the mechanical conditions affecting different parts of the bone. 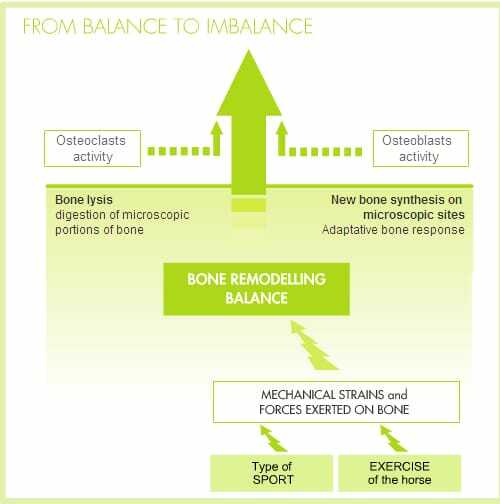 Bone is a very active and highly adaptable tissue : thus the bony areas of a competition horse which are subject to great stress, are stronger, denser and higher in calcium than those of an inactive horse which is out at pasture, resting or convalescing. On the bone surface, two main types of cells are constantly working together to create "new" bone tissue. Osteoclasts are responsible for "bone lysis", a phenomenon that actually involves the digestion (dissolution and demineralisation) of the bone at microscopic sites. Osteoclasts are activated by the body according to mechanical stresses on the skeletal structure, and they allow the body to "make free space" so that other cells, osteoblasts, can make new, and possibly more suitable, bone tissue. Osteoblasts synthesise the basic bone tissue : collagen. Osteoblasts also cause (trigger) collagen mineralisation. They are capable of synthesising new bone tissue, better suited to the physical stresses and strains to which the bone in question is subjected. But they work 7 times more slowly than osteoclasts. Bone remodellingChange in the shape of the bone as compared with its normal shape: the contours of the bone are changed in an X-ray. allows the skeletal structure to adapt constantly to the mechanical stresses to which it is subjected. The bone structure of a horse will therefore change according to its level of activity (workload) and the type of sporting activity asked of it.